Centuries and Sleuths is a gem of a book store: cozy, unique, with warm and friendly owners behind the counter. 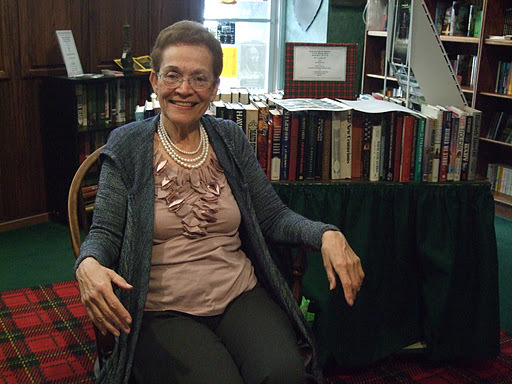 Today the Forest Park, IL store hosted the book launch for my writer’s group buddy, Helen Osterman. Helen chatted about her new release and third in a series, “The Elusive Relation” and gave interesting background information–with pictures–of the centuries old English country house that became the setting for her mystery. She admitted to using book research as an excuse to take vacations. Helen even provided delicious muffins made from the recipe her character, Emma Winberry, uses to bake muffins whenever she needs comfort food. Tonight I look forward to curling up (after the Bears game) with “The Elusive Relation” and getting to know Emma even better.